Pret A Manger is well known all around the world for its stylish, fresh and natural produce, as well as its excellent customer service. Kommando devised and delivered an innovative campaign, utilising Pret-branded pedicabs to transport customers to a new Pret store in Glasgow. A team of Kommando Brand Managers and Brand Ambassadors distributed brownie samples, money off coupons and helium balloons. To stretch this campaign’s message further, Kommando also placed branded wheelbarrows containing fresh fruit in several of the UK’s biggest cities. 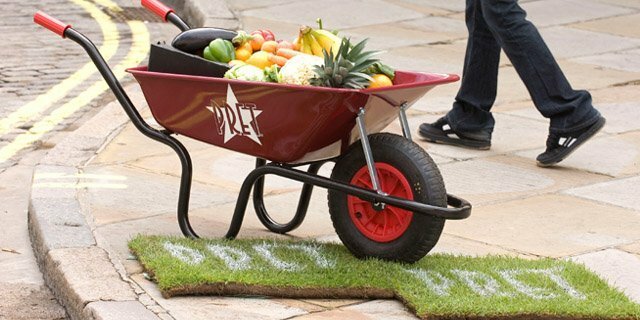 The wheelbarrows were positioned strategically to target areas of high footfall, in close proximity to Pret stores. This highly interactive guerrilla street campaign was designed to demonstrate the quality of customer service and the quality of food available with particular attention to Pret’s new healthy eating/ organic range. The campaign delivered a strong brand and product message to the desired audience in their everyday environment, which in turn created a powerful and lasting relationship between Pret and their consumers. Results included triggering purchases and future visits through 24,000 trial samples over a two day period.